Meme – an image, video or piece of text, typically humorous in nature, that is copied and spread around rapidly by Internet users. That would be the dictionary definition of it, at least. However, in real life (read: the Internet), memes represent a crucial part of an English learner’s day-to-day, without them even realizing it. Let me put it this way: if you refer to “cactus” as “catcus”, which is a cat with sharp spines, then you’re already learning English through memes. Now, this may not be the “traditional” way of learning and improving your skills but it is useful and creative, none the least. Believe it or not, I keep at least half of the memes in this article as posters in my classroom. As to why, they’re funny, memorable and often quite factual, which indirectly contributes to my students’ progress. Let me take you through some of my favorite English language memes and why I like them so much when it comes to language learning. Take care of the ones closest to you. Use commas. Otherwise, you’ll have a pretty organic dinner. And no matter what you do, never say “Let’s eat, grandma!” without explicitly emphasizing the comma! All lives matter. So does grammar. Again, know your commas. Life might just become easier for you. I’m sure most of you can relate when I say that out of the four language skills, speaking is probably your weakest when it comes to English. But, no worries – you’re not alone. In fact, that’s pretty normal. The majority of English learners have stronger listening, reading, and writing skills when compared to speaking, which is exactly what makes this meme so relatable. It’s a crazy world we live in… and the language we speak. However, if you know all of the things in this crazy meme, you’re literally just a step away from speaking English like a native. 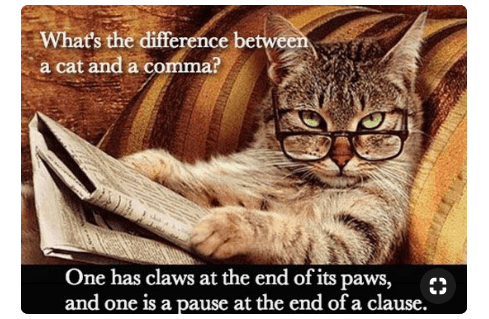 For whatever reason, cats always seem to find their way into good English language memes. Whether it’s a cat-cus or just a regular cat with claws and paws, more often that not, an English sound equivalent seems to appear from the dark. In this case, it’s the words clause and pause. Good job, Catmeister! Two past perfect verbs next to each other? Totally possible! While this sentence looks and sounds weird on the surface, it actually makes perfect sense in English. Of course, more context would have been preferable, just so that anyone who reads this knows that both of these actions happened in the past before another action in what is presumably a story fully narrated in the past tense. 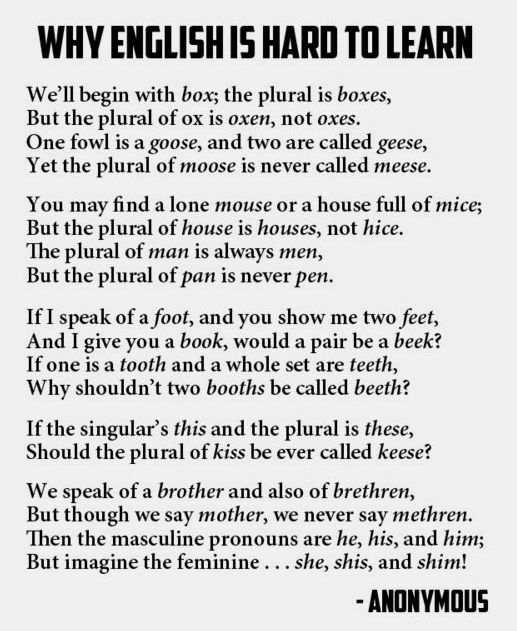 But still, totally possible… English is fun. #7 Stop doing it wrong. I’m sure we were all guilty of at least one of these ten things at some point. While English learners misuse words and expressions all the time, there are certain ones to stay clear of. As for these ten… they may damage your street cred quite a bit if you get caught doing them. #8 Equal rights for everyone. Animals have feelings too, you know? Don’t hurt them by saying things in English that make them feel like they deserve less than us. They’re fully koalified to take care of themselves. #9 This poem deserves a Grammy. This is easily one of my favorite pieces of poetry ever created. After five years, this poster still hangs unbothered above the whiteboard next to my desk. A true gem for English learners. #10 Leave the past behind. Indeed… I mean, why not just spell it as “bolony” or “baloney”? Who knows, right? Come on, at least give us something to work with?! Just one word that makes sense? Only she told him that she loved him. She only told him that she loved him. She told only him that she loved him. She told him only that she loved him. She told him that only she loved him. She told him that she only loved him. She told him that she loved only him. I could probably give/provide/gift/bless you with numerous/various/quite a few reasons why the constant expansion/growth/development of your English vocabulary is good, but… rules are rules, you know? #15 And I’m short on time! Sorry, we are closed due to a shortage of staff. 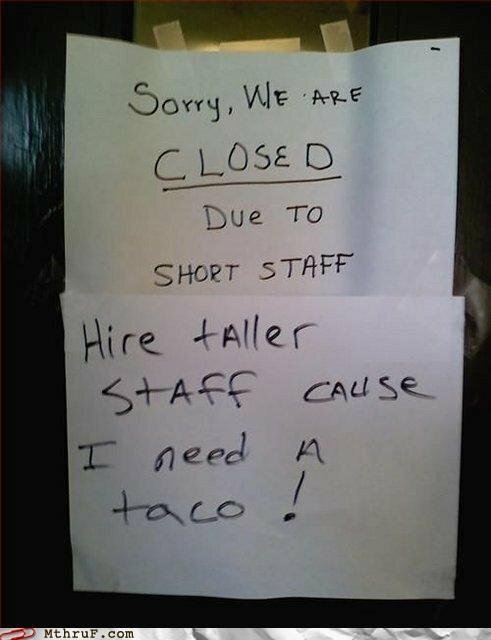 Sorry, we are closed as we’re short on staff. A no-no is a yes! Standardized English doesn’t allow the usage of double negations in a single sentence or phrase. 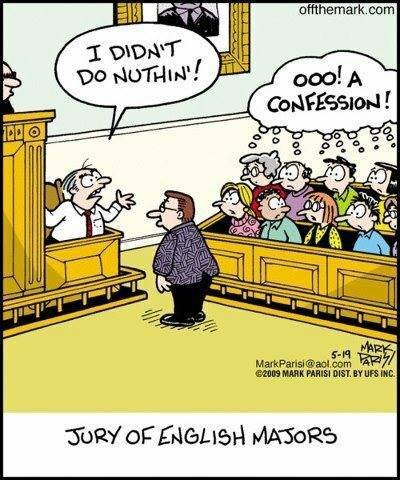 As such, two adjacent negations create a positive, which means the witness on the stand (as shown in the picture) said: “I did everything!” Ouch! My estimate is that this is how 90 percent of English language memes are born. Correct language use, people. It’s not that hard. By the way, am I the only one that does this keyboard thing? English is a beautiful language, and as you can see, memes often show that. Now, it may not be the ideal means of improving your language skills, but what you read or see in memes certainly sticks with you for a long time. You remember it, share it with others over a good laugh, and aim to keep it in your “meme treasury” at all times. One way or the other, it’s called “learning”. Whether your trying to understand English memes or cool English words, you’re going to need a good grasp of the English language. LingQ provides thousands of hours of English content for you to read in a range of categories. You can also import your favorite content from the web (blogs, YouTube, and so on) and turn those into interactive lessons on LingQ. Also, LingQ is available on mobile. Take your lessons wherever you go and listen to your target language, read your transcripts, and create review flashcards. LingQ’s language learning apps are available for both Android and iOS. Start learning new languages, simply and easily Get started for free!